All Filters All the pond filters Pump Sock Pre Filter Use in combination with a submerged pump to trap debris which acts simple bio filter and protects your pump. Is also an effective pre-filter. Little Giant FB-PW Designed to house a submersible pump. For ponds up to 400 gallons. Contains a fine pad and a coarse pad. Measures 5-3/4"H x 12-3/8"L x 6-1/4"W. Use with: PE-A, PE-1F-WG, PE-2F-WG, or PE-2.5F-WG. Little Giant PF-AD-PW Dual Pump Inlet Filter Fits onto the inlet of: PE-1F-PW, PE-2F-WG, PE-2.5F-PW. Dual unit includes a manifold adapter with cap and two PF-WG filters. PondMaster 2000 Filter Only Pondmaster 2000 (12" x 24") deluxe filter system using polyester and biological media. Pondmaster 2000 Filter requires 2 pads. Pads measure 12"x12". 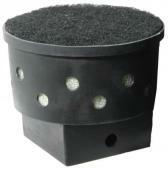 Provides mechanical and biological filtration from inside the pond.